Cheshire. It runs between Chester and the Kingsway Tunnel, which travels beneath the River Mersey. In various stages between 1968 and 1982. Well, it's kind of a long story. That's OK, I've got time at the moment. The story starts back in the mid 1960s, when the Ministry of Transport decided that a new route along the "spine" of the Wirral peninsula was required, heading south from the Kingsway Tunnel in the north, and mostly acting as relief from the A41. It was then constructed as far south as the M531 at Hooton, opening in 1972. Junction 2 is absolutely enormous, and has the kind of nice free-flowing links that some motorway-motorway connections like the M60-M62 junction at Simister, north of Manchester can only dream of. 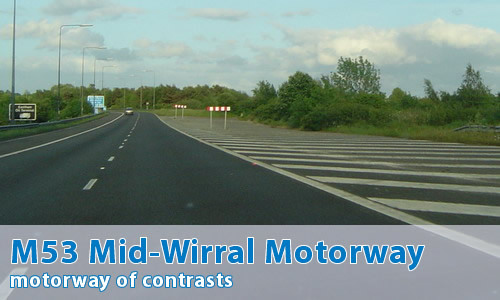 It has a grade-separated junction all of its own with the A551. It's all quite stunningly good, and well designed. Then the spur almost immediately crashes into a tiny roundabout, with absolutely no provision made for any extension to the west. These two facts have led to some serious speculation about an extension to the west and over the Dee Estuary. This seems somewhat unlikely, and no evidence has yet been found to support it. Indeed it is - and the general air of brilliance continues as the road heads south. Junction 3 is also far too good for words, with the A552 suddenly becoming a dual carriageway and flying over the top of the junction - the sort of thing that most junctions can only dream of. Add that to the fact that it's got a really clever design where the roundabout rises and falls so it's at the level of the motorway whilst passing under the A552, and at the level of the A552 whilst passing over the M53. This means less bridges and less visual intrusion on the local area. Hang on a minute, this sounds brilliant. What on earth is it doing here? It is quite brilliant. Travelling along the M53 feels like a big inter-urban motorway. However, things suddenly go horribly wrong. The motorway south of the M531 was never constructed. Indeed, it never even got close! It was so far away that even its southern terminus has been the basis of speculation, with some sources suggesting somewhere near Queensferry (perhaps near Ewloe), others near Stoak. Probably the best source so far found suggests that the motorway would have paralleled the A41 through to Backford. So, for several years the motorway just suddenly turned into the M531, though it was probably pretty obvious even to the relatively unobservant exactly what was going on, as you passed through the half-built junction between the two using the sliproads to continue onwards. Heading north there was even a bridge passing overhead that carried no traffic to help you work it out. Well, the M531 itself gained an extension, and suddenly it ended up not to far away from the planned end of the M53 itself. Despite the M531's poor standard of engineering (after all, it did start life as an unclassified road...) it became the reason that the M53 wasn't completed. Its reward? To be ruthlessly murdered, and renumbered "M53" just to hide the fact that the main motorway itself only managed to get half way. Is it really that poor? Yes, absolutely. Between junctions 5 and 10, the old M531 is there in all its glory. After the wide expanses and brilliantly engineered junctions of the northern section, this part is pants. It feels all narrow and claustrophobic. It's got junctions that are on top of one another. It's even got the outstandingly rubbish junction 6, where the motorway restrictions start and end at seemingly random places. It certainly doesn't feel part of the same road, that's for sure. Sounds delightful. What happens south of junction 10? The bit between junctions 10 and 11 was actually built as M53, and upon completion of this section came the big renumbering exercise. As a result, it (and the section to the south) is just dull. It's not big and overblown like the northern section, or narrow and rubbish like the M531 section. It's just kind of there. How about some photos then? OK then - see what you think! The M53 is indeed a motorway of two parts, but I wouldn't call it pathetic; its idiosyncratic. The old M53 extension was mothballed on cost and NIMBY grounds. I doubt the M53 will ever re-appear south of J5 on its proper route-the A550 dualling in 2060 is more likely! The junction lighting south of J6 is utterly appalling and road surfaces in the D2M bits (J9-J6) are poor too. Interestingly, the bridge which was to carry the "original" M53 north of J5 was demolished about 10 yrs ago. I think this would of been a very dangerous junction if it was ever built. I still maintain though that I doubt that the M53 would of ever of reached Ewloe, probably would of stopped at the current A550/A5117 junction. The biggest problem here is at J5 heading south, where the brilliant six lane wide zoomy inter-urban motorway dumps all its traffic onto two lanes (little more than a country back road compared to the motorway beforehand) just before a major junction and slings everything around to the right and then the left, to a strange inny-outy merging arrangement with traffic coming from the A41 and to that odd Vauxhall’s junction. The whole thing is a disaster pretty much every morning, with an inevitable queue heading south, especially during term times. It doesn't help that the lane drop before J5 is so badly signposted and doesn't become apparent until you turn the sharp bend after J4. The amount of accidents at the point of the lane drop is ridiculous, where people obviously try to cut across to the middle lane at the last moment to avoid hitting some strategically-placed barriers across the oceans of hatched tarmac, or realise their junction is about 200 yards further on and panic. And it only takes a couple of crumpled cars on the hard shoulder to bring half the motorway crashing to an even bigger halt, with traffic often backing up right to J4. I suppose better signs further back might help. But there is plenty of space around the middle of the motorway at this point to extend the width of the carriageway at least as far as J5, so that the lanes can be re-jigged to allow the outer 2 lanes can carry straight on without a pesky lane drop and the inner lane to then drop down to the junction. To add to your speculations, when M53 J2 was first opened the Upton Bypass wasn't built, so that huge spur just served the village of 'Upton (only)'. Presumably the junction at the end was remodelled following the arrival of the bypass, explaining the disappointing end. Despite the original bit of the M53 being so big and over-the-top, two of the bends near J4 aren't quite up to motorway standard and had advisory speed limits put on them, but they were removed after the locals complained: "60 on a motorway?". They're obviously not used to the slow, tight, under-funded motorway network which the rest of us have to use! Hi. Just thought I'd let you know that on the "Funny place to put a welcome sign" picture, the sign is to welcome traffic travelling southbound along the parallel minor road, Rivacre Road. What you have failed to mention is that J6 is effectively a cul-de-sac, leading to some oil refineries and the Vauxhall car plant... and nowhere else. It is physically possible to drive to other places, but only on private roads with signs reading "unauthorised users will be prosecuted". How the Vauxhall employees get to work if they don't have a car is a mystery.